With thanks to Chris Barker showing the flowers in detail. 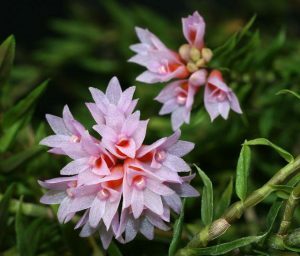 Dendrobium alaticaulinum is an attractive plant, bushy in form with pendent fleshy pseudobulbs or canes which can form substantial colonies covered in flowers. The delicate flowers are borne at the tips of the pseudobulbs in groups of up to 20 and are pink, sometimes with white tips to the sepals and petals. They are long-lasting and some plants are constantly in flower. The species is from high altitude in New Guinea and needs cool, humid conditions. It is one of the easier high altitude plants to grow but should never be allowed to dry out. Plants (well established seedlings) £15 each plus £5 for postage and packing. 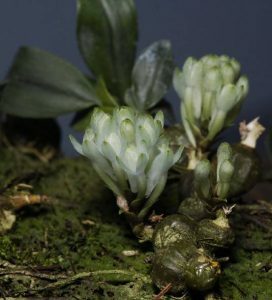 Dendrobium moniliforme was in cultivation over 1800 years ago in Japan, where it is often found growing on rocks and is sought after for medicinal uses. It is considered ‘strengthening’, and thought to promote longevity. It is also used as an aphrodisiac. It is a lovely and easy plant to grow, best in a small, well-drained pot in cool, humid conditions. It flowers in spring with surprisingly large, strongly fragrant flowers which can last up to 3 weeks.